Jean-Baptiste de Lully, originally Giovanni Battista di Lulli (November 28, 1632 – March 22, 1687), was a French composer of Italian birth, who spent most of his life working in the court of Louis XIV of France. He became a French subject in 1661. 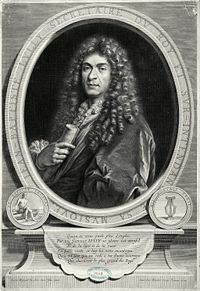 Lully greatly influenced opera in France as the Director of the Academic Royale de Musique in Paris and collaborated with librettists such as Moliere to produce dramas such as lyric tragedies and operas which made him the most famous French operatic composer of the seventeenth century. If the task of a conductor can be summed up in a simple fashion, it is bringing a sense of "oneness" to the performance of a given musical work. Lully is generally considered the first important modern conductor, and his ensemble, les petit-violon, was the precursor to what would become the modern symphony orchestra. Lully's penchant for exactitude in performance won him many admirers. He may have been the first conductor to insist on uniform bowings in which each string section bows musical phrase the same manner. This technique, known as premier coup d'archet (first stroke of the bow) became a defining characteristic of his conducting philosophy. This tradition, as introduced by Lully, became the fashion in orchestral playing in Europe and is generally practiced to this day. By providing a specific performing directive for his ensemble, Lully and his musicians were manifesting a subject-object reality within their relationship. Though Mozart thought premier coup d'archet to be a novelty of sorts, this tradition of uniform bowing became an established tradition. Born in Florence, the son of a miller, Lully had little education, musical or otherwise, but he had a natural talent to play the guitar and violin and to dance. In 1646, he was discovered by the Duke of Guise and taken to France by him, where he entered the services of Mademoiselle de Montpensier (la Grande Mademoiselle) as a scullery-boy. There is some dispute over this, however; it is actually possible that he was employed to teach her Italian. With the help of this lady, his musical talents were cultivated. He studied the theory of music under Nicolas Métru. A scurrilous poem on his patroness resulted in his dismissal. He came into Louis XIV's service in late 1652, early 1653 as a dancer. He composed some music for the Ballet de la Nuit which pleased the King immensely. He was appointed as the composer of instrumental music to the King and conducted the royal string orchestra of the French court, Les Vingt-quatre Violons du Roi (Twenty-four Violins of the King) or the Grande Bande (large band). He tired of the lack of discipline of the Grande Bande, and with the King's permission formed his own Petits Violons. Lully composed many ballets for the King during the 1650s and 1660s, in which the King and Lully himself danced. He also had tremendous success composing the music for the comedies of Molière, including Le Marriage forcé (1664), L'Amour médecin (1665), and Le Bourgeois gentilhomme (1670). Louis XIV's interest in ballet waned as he aged and his dancing ability declined (his last performance was in 1670) and so Lully pursued opera. He bought the privilege for opera from Pierre Perrin, and with the backing of Jean-Baptiste Colbert and the king, created a new privilege which essentially gave Lully complete control of all music performed in France until his death. He was a notorious libertine. In 1662, he married Madeleine Lambert, daughter of Lully's friend and fellow musician Michel Lambert, and proceeded to have ten children by her. But at the height of his career in 1685, he felt confident enough to flaunt his relationship with Brunet, his young page from La Chapelle. Although his life is full of meteoric heights, his love affairs with boys and women brought him down in scandal several times to the great displeasure of Louis XIV. Despite these scandals, he always managed to get back into the good graces of Louis XIV who found Lully essential for his musical entertainments and who thought of Lully as one of his few true friends. In 1681, Lully was appointed as a court secretary to Louis XIV and was ennobled, after which he wrote his name "Jean-Baptiste de Lully" and was addressed as "Monsieur de Lully." On January 8, 1687, Lully was conducting a Te Deum in honor of Louis XIV's recent recovery from illness. He was beating time by banging a long staff (a precursor to the baton) against the floor, as was the common practice at the time, when he struck his toe, creating an abscess. The wound turned gangrenous, but Lully refused to have his toe amputated and the gangrene spread resulting in his death March 22, 1687. He left his last opera, Achille et Polyxène, unfinished. Lully's music is from the Middle Baroque period, 1650–1700. Typical of Baroque music is the use of the basso continuo (or simply continuo) as the driving force behind the music. The pitch standard for French Baroque music was about 392 Hz for A above Middle C, a whole tone lower than modern practice where A is usually 440 Hz. Lully's music is known for its power, liveliness in its fast movements and its deep emotional character in its sad movements. Some of his most popular works are his passacaille (passacaglia) and chaconne which are dance movements found in many of his works such as Armide or Phaëton. His Miserere, written for the funeral of the Minister Seguier, is considered a work of genius. Equally acclaimed are his minor sacred compositions. The influence of Lully's music produced a radical revolution in the style of the dances of the court itself. Instead of the slow and stately movements which had prevailed until then, he introduced lively ballets of rapid rhythm. He affected important improvements in the composition of the orchestra, into which he introduced several new instruments, and enjoyed the friendship of Molière, with whom he created a new music form, the comédie-ballet, which combined theater, comedy, and ballet. Lully founded French opera (tragédie en musique or tragédie lyrique), after having found Italian-style opera inappropriate for the French language. Having found a congenial poet and librettist in Philippe Quinault, Lully composed many operas and other works, which received enthusiastically. Lully can be considered the founder of French opera, having foresaken the Italian method of dividing musical numbers into separate recitatives and arias, choosing instead to combine the two for dramatic effect. Lully also opted for quicker story development as was more to the taste of the French public. ↑ Rictor Norton, Bisexuality Rictor Norton, 2002. December 6, 2007. Scott, R.H.F. Jean-Baptiste Lully. Peter Owen Limited, 1973. Rosow, Lois. Lully, Jean-Baptiste" in New Grove Dictionary of Opera|The New Grove Dictionary of Opera. ed. Stanley Sadie (London, 1992). ISBN 0333734327. History of "Jean Baptiste Lully"
This page was last modified on 1 May 2018, at 20:14.